Tensions and hostilities continue unabated between South Sudan and its northern neighbor Sudan, and Doctors Without Borders/Médecins Sans Frontières (MSF) is scaling up its emergency response by treating people injured in the latest violence, giving material and staff support to local clinics and hospitals, and providing relief to people displaced by the fighting. MSF currently provides life-saving surgery in Aweil and Agok for patients wounded in the recent violence. The organization also reinforced its surgical response capacity in case of a general degradation of the situation. MSF has also donated medicines and medical supplies to local hospitals in Abiemnom and Bentiu in Unity State, both of which have received high numbers of wounded from the recent clashes. Two of MSF’s medical staff have been temporarily seconded to support the Bentiu hospital. Along the northern border of Unity State, MSF provides life-saving medical care and clean water to Sudanese refugees in Yida Camp. Over the last six weeks more than 6,000 new refugees have fled from armed conflict in South Kordofan. As the rainy season approaches and the population continues to swell, MSF is stepping up its medical services to respond to health care needs and epidemic management within the population. MSF is also running mobile clinics in the Abyei region, near the conflict area, distributing shelter materials and relief items including blankets, soap, and cooking equipment to people displaced by the violence. In Rumamer, where the number of displaced people has tripled in just a few days, MSF has distributed relief items to 1,120 people, mainly women and children. In addition to its current response to the fighting around the border, MSF continues to provide medical care in two Upper Nile State refugee camps, in Jamam and Doro, which host around 90,000 refugees who fled violence in Sudan’s Blue Nile State, north of the border. The number of refugees in Blue Nile State continues to grow, and the refugees face serious water shortages. MSF and other humanitarian organizations are racing to bring in sufficient equipment and medicines before the rainy season makes roads in this remote area difficult or impossible to use. The latest violence is not the only challenge in the country. South Sudan is facing multiple crises including a precarious food security situation, massive refugee influxes, large scale outbreaks of infectious and deadly diseases, and intense inter-communal tensions and violence. In South Sudan’s Jonglei State, MSF continues to respond to the needs of thousands displaced in extremely violent inter-communal clashes, and in Warrap State MSF is responding to an outbreak of measles by undertaking an emergency mass vaccination campaign for around 40,000 children between the ages of 6 months and 15 years. In addition, MSF provides outpatient care in two locations in Renk County to recently returned Southerners who left Khartoum. MSF has been working in South Sudan since 1983. More than 2,000 South Sudanese staff work alongside almost 200 international staff in more than a dozen projects in eight federal states. 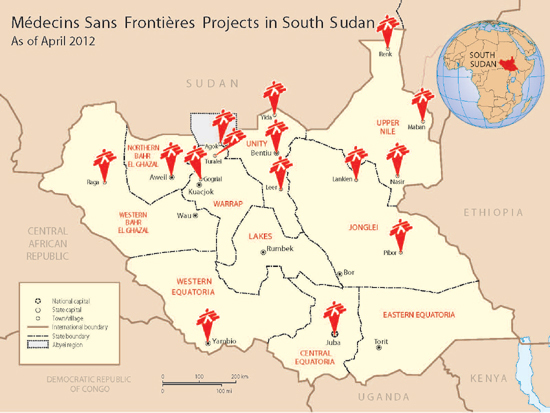 MSF's activity in South Sudan.